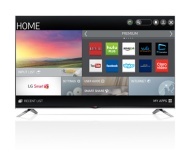 alaTest has collected and analyzed 233 reviews of LG 55LB6100 Series. The average rating for this product is 4.7/5, compared to an average rating of 4.6/5 for other products in the same category for all reviews. People are impressed by the design and sound. The price and image quality also get good comments, whereas many are less positive about the reliability. We analyzed user and expert ratings, product age and more factors. Compared to other products in the same category the LG 55LB6100 Series is awarded an overall alaScore™ of 88/100 = Very good quality. Very clear picture we do not have cable or satellite and rely on an internal antenna. Although the TV has more features than we will use it's nice to know they are there if we want to use them. the quality of the picture is outstanding! So crisp and so clean! It definitely makes watching tv more realistic! Picture is amazing, easy set up enough said! Highly recommend this to anyone. The quality and performance is very good for the money however the software is missing features and could look better. This TV has all the qualities I was looking for! I've never owned an LG product, however, since purchasing this Smart TV I regret that fact. This product has met and exceeded my expectation and I have been recommending it to any and all who are interested. Great TV that lives up to it's promises! This TV has been great for me. I have had it a few months now and had no issues. I like the smart TV menu more that the TV I have that was twice the price. I am very happy with my purchase. I've always been more than a bit underwhelmed by HD, so for years we were content with our 32" analog clunker with Verizon FiOS. But we decided to become cord cutters at the start of 2015, meaning time for a digital HD TV. This is our second LG HDTV, the first one is a smart 60" plasma 3D, which has a awesome picture, and the 55LB6100 has a awesome picture as well.